If I had to choose just one Duran Duran song for Desert Island Discs, then I’d have to go for Save A Prayer. If I could pick another song, it would be Secret Oktober. It’s a track that will be familiar to some Duran Duran fans but maybe less so to others. It was the B-side to the band’s 1983 single, Union of the Snake – in old money, that’s the other side of a seven-inch vinyl single. 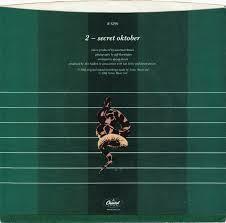 It’s a soft and haunting track, and from the day I bought the record, some thirty-three years ago now, I’ve always preferred Secret Oktober to the A-side. That’s not to say that I dislike Union of the Snake. Far from it, I think it’s a great song, but it’s the B-side which has stayed with me. One of the highlights of going to see Duran Duran live was when they played Secret Oktober live during what was effectively a greatest hits tour – I think it was around 1998. And I do remember feeling like I was showing off because I knew all the words and was singing along loudly. I’d love to hear them play it again in a live set. Back in the day, B-sides were always a mixed bag. Some would give the impression of being half-formed, half-arsed bits of music hastily put together in order for the single to be released. Others would be hidden gems that fought with the A-side for the affections of the listener. Secret Oktober was one such track, and it remains one of my favourite Duran Duran songs. I still don’t know why there’s a ‘k’ in ‘Oktober’, though, so if any Duran Duran fan could enlighten me, I would be forever grateful.